Our main products are knitted & woven wears for ladies, such as dress, T-shirt, top blouse, skirts, vests, coats, jeans, sportswear, and so on. Covering an area of about 1,500 square meters, our factory has more than 100 professional workers. We have introduced advanced production equipment and technics to meet different customers' requirements. stylish zip-back plus mono print dress,new arrival high fashion xxl size women casual dress no. men's t-shirt, sportwear and so on. summer fashion xxl size women lace casual dress product type plus size women dresses art no. your kind inquiries are warmly welcomed ! your feedback is highly appreciated, we are looking forward to cooperate with you. we have own sample room,factory and experienced techical masters to ensure high quality and workmanship. 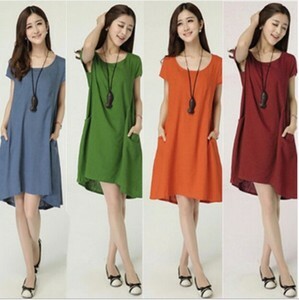 Alibaba.com offers 22,082 xxl size women casual dress products. About 72% of these are casual dresses, 69% are plus size dress & skirts. A wide variety of xxl size women casual dress options are available to you, such as anti-static, anti-wrinkle, and breathable. You can also choose from spandex / polyester, spandex / cotton, and polyester / cotton. As well as from plain dyed, printed, and garment dyed. And whether xxl size women casual dress is worsted, satin, or woolen. There are 22,110 xxl size women casual dress suppliers, mainly located in Asia. The top supplying countries are China (Mainland), India, and Pakistan, which supply 97%, 1%, and 1% of xxl size women casual dress respectively. Xxl size women casual dress products are most popular in North America, South America, and Eastern Europe. You can ensure product safety by selecting from certified suppliers, including 2,789 with Other, 472 with ISO9001, and 335 with BSCI certification.